Scott Snyder's Swamp Thing Vol. 2: Family Tree contains just four Swamp Thing issues, plus the "Zero Month" issue and the first Swamp Thing annual. As such, the book comes off a little thin; while the reader is treated to the first appearance of the new Alec- Holland-as-Swamp-Thing, the story mainly serves to spotlight one of Swamp Thing's long-time enemies. Though Swamp Thing and companion title Animal Man began at the same time and are both racing toward the "Rotworld" crossover, Animal Man has succeeded in standing as a title on its own; with this foreshortened volume, Swamp Thing continues to feel like a title biding its time until the crossover, even if in generally enjoyable fashion. In previews I had some concern about Swamp Thing's new horn-headed design, but on the page artist Yanick Paquette and others depict it quite well. Snyder's Swamp Thing is the "warrior-king" of the Green, and his horned helm and ridged body armor reflect this well; Swamp Thing has never looked so regal. There's certainly debate to be had as to whether Snyder's "built for war" Swamp Thing improves upon or detracts from Alan Moore's "slow to anger" version, but for the Swamp Thing that Snyder has created, his new appearance coincides nicely. The first two chapters of Family Tree wrap up the cliffhanger from the first volume, Raise Them Bones; Swamp Thing rescues the kidnapped Abby Arcane and the two escape to regroup. The following two chapters, as well as the zero issue and the annual, all focus in one way or another on Swamp Thing's arch-nemesis, Anton Arcane. In giving Arcane so much space, Snyder takes a route similar to Geoff Johns's use of Sinestro in Green Lantern; more than just a villain, Arcane is a vital character here with a backstory and strong connection to Alec Holland himself. Arcane is and has always been a delightfully grotesque villain, and Family Tree is a gorgeous read largely due to some great "stunt" artist "casting" of Francesco Francavilla for Arcane's noirish first appearance and Becky Cloonan for a Romeo-and-Juliet-esque tale of young Holland's forgotten first introduction to Abby and Arcane (both artists did notable turns with Snyder on his Batman-title work, too). While Arcane, again, is visually interesting, Snyder does not give him Sinestro's depth; Snyder's Arcane is notable for having plagued all the various iterations of Swamp Thing through time, but always with a villainous single-mindedness. Snyder establishes well the danger Arcane poses to the Swamp Things, but the audience is left without knowing much about Arcane himself -- questions like who Arcane was before he became a servant of the Rot, how he became such, and so on go unanswered. Throughout this book, Arcane is bad because, well, he's bad. As well, much of Family Tree's the third chapter takes place in flashback, plus the zero issue and the annual, devoting more than half of the book to something other than the present action. This has the effect of making this second Swamp Thing volume appear as though it's mostly standing still. In two issues, Swamp Thing fights the Rot's avatar Sethe and wins, then he fights Anton Arcane and wins, and then there's two tales of the past. I'm skeptical how much of this is really necessary and how much is filler; while Animal Man has offered complex family drama and explored Buddy Baker's burgeoning new powers, Swamp Thing spent a lot of time on Holland's reluctance about his (inevitable) transformation into Swamp Thing. Once it crossed that threshold, Swamp Thing doesn't seem to have much place to go until Rotworld. At the same time, by virtue of the flashbacks and even a Green "vision," Snyder is able to make considerable use of the human Alec Holland in this book. 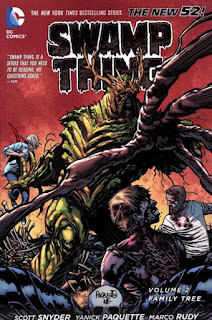 An emphasis on "the man behind the monster" has been a hallmark of the New 52 Swamp Thing series, and setting aside the controversies inherit in that, it does help to make Swamp Thing a more relatable character; Snyder reminds the reader a couple times that there's fragile flesh underneath Swamp Thing's crusty surface. Adding a "young love" to Alec and Abby's histories helps bridge the somewhat awkward gap in which she had a relationship with Alec's former Swamp Thing doppelganger and makes their pairing more believable overall. Snyder also hits a Swamp Thing touchstone by introducing Jason Woodrue (presumably still the future Floronic Man) into young Holland's life, and I wouldn't mind seeing another flashback tale in the same period, drawn again by Cloonan, that follows up on those events -- some Smallville-esque "pre-Swamp Thing" stories, as it were. Swamp Thing: Family Tree isn't objectionable by any means; in fact, in its scant offerings I probably came to like Alec Holland and Abby Arcane more than I did before. The crossover is the problem; often the danger with crossovers is that they threaten to overwhelm the story itself, and Rotworld is on a bad track, having similarly sucked some life out of the final Frankenstein volume as well. The upside is that with all this emphasis on Rotworld, perhaps that means there are good things to come, and I look forward to seeing what the Swamp Thing title does when it finally gets there. i love Snyder and Lemire, and i really like Swamp Thing, Animal Man, and Frankenstein: Agent of SHADE. but Rotworld had me skipping those issues. it was just a big snooze fest for me. Snyder's Swamp Thing run got off to such a promising start, and I was looking forward to see what he was going to do with the character once he got Rotworld out of the way. However, much to my disappointment, he only had one story to tell, and took 19 issues and an annual to do it. I think Snyder is a good writer but I just do not understand why he insists on RetConing every single Moore/Miller/Morrison story out there. He rewrites everything about both the Swamp Thing and Animal Man books and now he's off to rewrite Year One and The Killing Joke. Again, he is a good writer but he is still far from the three I mentioned so why do it?